Baseball season is right around the corner for Hofstra. The Pride is coming off a season in which they finished with a 25-25 record. A big step up from years prior, Hofstra is hoping to build off that .500 record and put together a great year. This is a team filled with a lot of youth and new talent. After losing some valuable players from last season, this large group of newcomers are hungry for playing time and will do whatever they can to provide a spark and help win games. There are a lot of questions regarding this team heading into the new season, but also a lot of optimism. 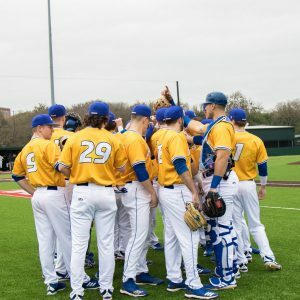 The pitching staff was one of Hofstra’s biggest strengths from 2018, but now, after losing some valuable arms, Russo and pitching coach Blake Nation will be keeping a close eye on what these new pitchers can do. One of the valuable arms lost, John Rooney, was recently drafted by the Los Angeles Dodgers and will leave a big hole in the staff. Despite the loss, Russo believes these new guys and the upperclassmen pitchers can step up and deliver quality innings.